When the Affordable Care Act took shape last year, a trio of New York entrepreneurs saw a big opportunity: 40 million people on the brink of choosing their own health insurance — one of the most confusing processes known to man. Anyone who could make that process simple and easy stood to win huge. So they launched Oscar Health to do just that. Starting with New York City, Oscar’s founders believe the health insurance industry needs an overhaul to provide a better customer experience, and that human-centric design will lead the charge. As Head of Product, Eddie Segel and the team at Oscar are bringing this vision to life. With customer-friendly data visualizations and streamlined interaction design, Segel is helping Oscar make health insurance effective and effortless. At First Round’s recent Design+Startup event in New York, he outlined the four strategies Oscar has deployed to deliver this unique brand of service to people who truly need it. As the first new commercial health insurer to enter New York in 15 years, Oscar aims to be fundamentally different. While its core offering is basic — it collects money from members and pays for their care when they need it — the company is vocal about using both technology and design to reimagine the system from the ground up. Design lets us turn what is complex into a simpler story. ONE: Know what simple looks like. Clear, limited calls to action. Language isn’t just about words. You have to find a brand voice that speaks to the audience you're trying to reach, and that's right for the problem you’re trying to solve. In Oscar’s case, this meant making health insurance easy to understand for people who had never engaged with it before while remaining knowledgeable and trustworthy. The cartoons were crafted to meet this challenge, while also communicating Oscar’s usability and values. Fulfilling the company’s design philosophy of “simple and human,” the graphics represented a cross-section of New York’s health insurance consumers with emphasis on diversity, kindness and accessibility. That second sentence pulls double duty. Because visitors to the site don’t know who “we” is, they substitute themselves — and everyone wants the best healthcare for themselves and the people they love. In essence, that’s what Oscar is promising. And then, right under that, users are prompted to “see how we’re different,” leading them down a clear path that will explain how they are distinct from the rest of the insurance establishment. Guide people one step at a time. A product’s friendly tone has to carry over to become user-friendly navigation. “Users should always know what to expect and what their options are,” Segel says. This is especially important when people are presented with too many options, like picking between competing health plans. By the time prospective customers have filled out this information, Oscar can present them with personalized recommendations rather than a page jam-packed with options that have nothing to do with the user. Oscar even opted to present one potential insurance package at a time to keep people focused and make sure they don’t get overwhelmed — and this too takes place on the homepage so users can retrace their steps if they need to. “If you go to other insurance websites or even the government sites, it can take 30 minutes just to figure out how much the thing you’re about to buy is going to cost," says Segel. With Oscar, once they’ve instantly generated a quote, users still only have two major calls to action to contend with: see other potential quotes, or choose the plan in front of them. When people have too many options, they are likelier to abandon a process or require help. One choice at a time keeps them engaged in the process and drives them toward signing up. Less information is more helpful. This seems countintuitive. Even when you ask people, they’ll tell you they want as many facts as they can get. Especially if it concerns their health or how much they’ll be paying. This is one of the reasons why health insurance and fine print have been attached at the hip for so long — but for most, it’s become more of a headache than a helper. By revealing more and more data along the way, Oscar guides users as they proceed through the process. There are always going to be users who want to decide on a package quickly, get in and get out as fast as they can. And there will always be users who want to know everything they possibly can before taking action. No matter what the situation is, the design of the site reinforces that the company is there to help. Hide the details until they're needed. That's how the same design can serve all users at once. TWO: Bust complexity in the right places. Everyone working on the billing product had to become an expert in both health insurance and consumer behavior to view the project through the right lens. You need to deeply understand your business before you can simplify your product. "Get rid of all of the noise," says Segel. "When people get their bill, they care about two things: how much they owe and by what date." With this in mind, Segel and his team turned the example bill on the left into the final product on the right. The key is to focus on primary use cases for now, while rolling out additional features almost daily. This isn’t just about aesthetic discipline, even though white space does help, it’s about investing in the analytics to understand how people really use things and what they really want. THREE: Put data to work for your users. The simplest website also has to be the smartest one. When you visit Google, there’s just one box where you describe what you're looking for. The only reason this is possible is because of the massive analytical and algorithmic complexity that exists under the surface. Similarly, at Oscar, to keep things easy for users, the simplicity of the site has to be underpinned with an intelligent system for interpreting symptoms, splicing costs, suggesting doctors, and tracking patients. This is why Oscar’s search functionality is designed to recognize conditions based on everyday descriptions. “Like if someone types in that they can’t stop wheezing, we can right away recognize that it could be asthma and suggest they see a respiratory specialist," Segel says. All of this requires a lot of data collection and dissection. The company has made a point of pulling in information from many different sources and cross-indexing the way regular people talk about their health with medical vocabulary and diagnoses. This includes connecting members to real live qualified physicians as soon as they’re needed. When you get to this level of data collection, you allow users to recognize patterns, and you can give them more personalized pathways through your service or site. FOUR: Design what you need, not what you want. Focus is hard, but you're nowhere if you don't stick to your priorities. In some ways, Oscar takes the concept of focus to a rare degree. “Some early designs were bloated with features — even people on the team didn’t know where to click," says Segel. To get back on track, the Oscar team pared everything down to just a handful of fundamental features. Then Segel had them redesign toward their fundamental goals starting from scratch. “Oscar was founded with a really strong vision but an abundance of opportunity," he says. "Once we all understood what we needed to accomplish as a company, it was easy to create the version of the site you see today where users always know what to do next." Design set the direction for the company from the very beginning. For a long time, a small group including Segel and the founders contemplated the design of the site and the service as a blank slate. And when they met with investors, prospective hires and regulators, it was the design mock-ups they took along that made the most compelling case for the business. Having focused designs demonstrating how different they were from existing insurance offerings became a beacon for the company, and helped leadership quickly determine what was resonating and what wasn’t. "Engineering takes forever. Business operations takes forever. Design can keep pace with your thinking," Segel says. 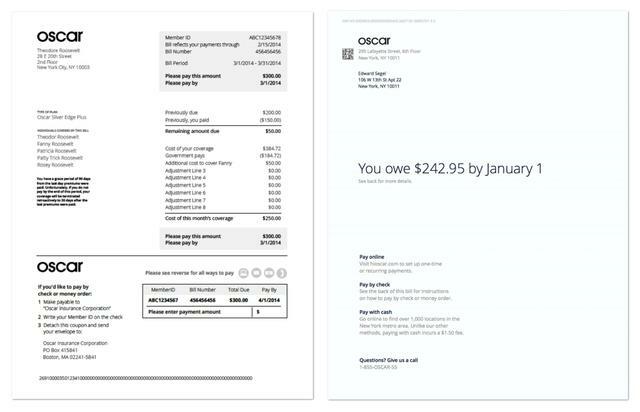 By making design central to its disruptive strategy, Oscar has differentiated itself as a consumer-focused health plan. And it's these principles that will help it change health care expectations for the rest of the country’s uninsured.